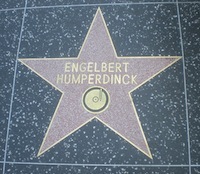 Not many people realize that Engelbert Humperdinck‘s smash hit “Please Release Me, Let Me Go” is actually a much older song titled simply, “Release Me.” Humperdinck took the song to the heights of the UK Singles chart in 1967. It stayed at the top for 6 weeks and was the highest selling single in the UK for that entire year. The immortal words “please release me, let me go” (lyrics here)were first published in 1946 by Eddie Miller, James Pebworth and Robert Yount. Miller couldn’t find anyone to record the song, so in 1949 he recorded it himself. Afterward a host of recording artists clamored for the chance to record their own version. Besides Engelbert Humerdinck, other celebrities like Little Esther Phillips, Kitty Wells, Jerry Lee Lewis, Elvis and even Def Leppard recorded the song. “Release Me” is a mournful plea from someone to his lover, begging her to release him as he no longer loves her and has moved on with a new lover. Few things could be sadder to hear from a loved one that not only does he no longer love you, but he’s already gone. Is it foolish to cling to what we once had, in hopes that it was all just a big misunderstanding? If our loved one has already successfully moved on, maybe there is a hint of foolishness to want things to go back to the way that they were. And what if your loved one is the one making the mistake? Perhaps his new love is not all that he thought it was cracked up to be. In that case, should we be sitting around waiting, or is moving on the best for all concerned? Each situation is different, of course, but when something like this is dropped on you from the blue, moving on may be the only way to truly heal from a betrayal of trust. By that point, “please release me, let me go” may be your plea, not the other way around.